It's not about perfect behavior. It's about passionate hearts. It's hard enough to train kids to behave, but good behavior isn't what Jesus calls for in the Bible. He wants hearts and souls that are shaped in vibrant faith and love toward God and others. 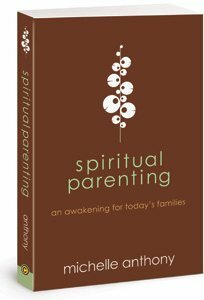 In Spiritual Parenting, Dr. Michelle Anthony places the dependence upon God for our child and calls the reader to a heart posture of obedience and faithfulness. The end goal is a vibrant faith that is passed on from one generation to another. Parents are, by the power of God's Spirit, to obey and depend on God in order to create an environment God can use to beckon our kids to Him. Isn't it time to embrace this simple, but revolutionary concept?